CO.GEO s.r.l., with over 40 years of experience in the water well industry worldwide, has unrivalled expertise in the construction of water supply boreholes, from 100 mm to 1000mm in diameter and up to 1500m deep, furthermore operate a large transport fleet, ensuring rapid delivery of equipment and materials. Constant investment in new equipment keeps us at the forefront of the industry, with health and safety and environmental concerns always at the top of our agenda. Recent investment in drilling water-cleaning equipment has resulted in less waste material going to landfill. 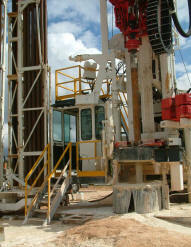 Minimal use of drilling additives to reduce environmental and formation damage is also a large consideration.